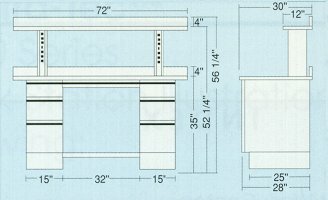 This is a page of examples of 6-foot long workbenches. These and many other combinations are possible. These examples are built with BENCH HEIGHT cabinets. Desk Height cabinets are available. Build your perfect bench using options and accessories pages or call for free design help. All workbenches are standard with 30" deep tops, 12" deep shelves, and 16" tall shelf supports. 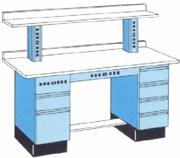 Many other sizes and work surface materials are available. ET-6000: Consists of one B-1106 three drawer cabinet; one B-1113-HR two drawer one door hinged right cabinet; one FR-1803 foot rest; one A-1503 cosmetic apron; two SS-1401 shelf support with power; one T-4005-SE 1-1/4" laminated self-edged counter top; one T-4025-SE shelf; and two T-4090-SE backguards all of same construction. 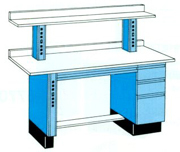 ET-6100: Consists of one B-1106 three drawer cabinet; one B-1105 four drawer cabinet; one FR-1803 foot rest; one A-1503 cosmetic apron; two SS-1401 shelf support with power; one T-4005-SE 1-14" laminated self-edged counter top; one T-4025-SE shelf; and two T-4090-SE backguards all of same construction. ET-6110: Consists of one B-1118-HL one drawer one door hinged left cabinet; one B-1106 three drawer cabinet; one FR-1803 foot rest; one A-1503 cosmetic apron; two SS-1401 shelf support with power; one T4005-SE 1-1/4 laminated self-edged counter top; one T-4025-SE shelf; and two T-4090-SE backguards all of same construction. ET-6200: Consists of one B-1301 leg with power; one B-1105 four drawer cabinet; one FR-1805 foot rest; one A-1505 cosmetic apron; two SS-1401 shelf support with power; one T-4005-SE 1-1/4" laminated self-edged counter top; one T-4025-SE shelf; and two T-4090 SE backguards all of same construction. ET-6300: Consists on one B-1301 leg with power; one B-1106 three drawer cabinet; one FR-1805 foot rest; one A-1505 cosmetic apron; two SS-1401 shelf support with power; one T-4005-SE 1-1/4" laminated self-edged counter top; one T-4025-SE shelf; and two T-4090-SE backguards all of same construction. ET-6310: Consists of one B-1301 leg with power; one B-1118-HR one drawer one door hinged right cabinet; one FR-1805 foot rest; one A-1505 cosmetic apron; two SS-1401 shelf support with power; one T-4005-SE 1-1/4" laminated self-edged counter top; one T4025-SE shelf; and two T-4090-SE backguards all of same construction. ET-6630: Consists of one B-1119-HL one door hinged left cabinet; one B-1105 four drawer cabinet; one FR-1803 foot rest; one AP-1603 apron with power; two SS-1401 shelf support with power; one T-4005-SE 1-1/4" laminated self-edged counter top; one T-4025-SE shelf; and two T-4090-SE backguards all of same construction. ET-6650: Consists of one B-1106-PP two drawer one power panel cabinet; one B-1105 four drawer cabinet; one FR-1803 foot rest; one AP-1603 apron with power; two SS-1401 shelf support with power; one T-4005-SE 1-1/4" laminated self-edged counter top; one T-4025-SE shelf; and two T-4090-SE backguards all of same construction. ET-6660: Consists of one B-1106-PP two drawer one power panel cabinet; one B-1105-PP three drawer one power panel cabinet; one FR-1803 foot rest; one AP-1603 apron with power; two SS-1401 shelf support with power; one T-4005-SE 1-1/4" laminated self-edged counter top; one T-4025-SE shelf; and two T-4090-SE backguards all of same construction.